Yesterday a little before noon I jumped in my car and headed to UT to attend the Rackspace Cloud Event. 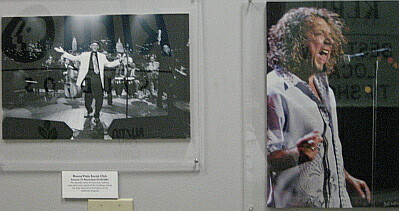 It was held on campus in the same building that “hosts” (bad pun intended) the local NPR station as well as the studio that Austin City Limits is filmed in. It was this studio that Rackspace used for their event. It would be interesting to see this same chart done by revenue. I have a sneaking feeling the managed hosting side would go shooting off the chart. Of course once you have new customers you can always look to up-sell them. Mosso is now refered to as “Rackspace’s Cloud Hosting Division, powered by Mosso.” It will be interesting to see how they handle the branding transition going forward and if they drop the Mosso name completely. Speaking of Mosso, I didn’t realize it, but in chatting with Emil Sayegh, formerly Rackspace’s VP of product management and Marketing and now the Mosso GM, Mosso was originally an incubator project of Rackspace’s, funded a couple of years ago. Cloud Files (formerly “CloudFS”): Rackspace’s cloud-based storage. This is where Jungle Disk will fit. Lombardi Blueprint will be making use of this when we add file attachment capability to the product in our December release. Cloud Servers: Will offer server capacity for customer applications (vs. sites) in the cloud. This is where Slicehost fits. 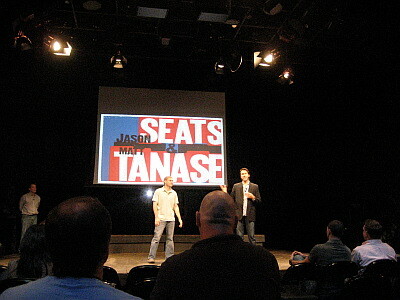 Slicehost founders Jason Seats and Matt Tanase. 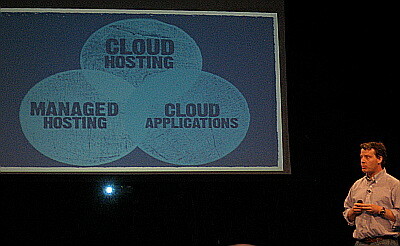 Cloud Hosting: Which yesterday’s event focused on. Managed Hosting: “an advanced type of dedicated hosting… Unlike basic dedicated hosting, managed hosting offers system level administration and support, comprehensive Internet infrastructure and extensive services that relieve IT departments of many critical, but costly responsibilities.” (We use this service to host Lombardi Blueprint). Looks like Cloud hosting has bubbled to the top. I’m psyched for next week’s customer conference down in San Antonio and learning more about what Rackspace is up to. I met a few of the execs yesterday and warned them that I would come armed with a recorder to do some podcasting. I will be posting those here on the blog so stay tuned. I ran into Red Monk Pundit Michael Cote yesterday, sporting a very sharp shirt, and had a quick chat after the event. Here’s his take and pics from the event. This entry was posted on Thursday, October 23rd, 2008 at 1:38 pm and is filed under Uncategorized. You can follow any responses to this entry through the RSS 2.0 feed. You can leave a response, or trackback from your own site. With the release of openstack publicly.. 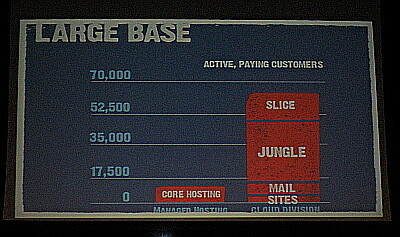 I really think that within 4-5 years rackspace will have more CLOUD customers than normal dedicated server customers.